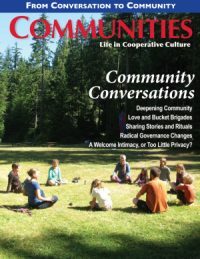 Choose Your Free Digital Back Issue of Communities Magazine! What is it like to live in a community? How do you start one, sustain it, and solve the hardest challenges? Are there ways to add more cooperation into the world and into our everyday lives? Communities magazine exists to answer these questions. Each season for over 42 years now “CMag” has pumped out quality issue after issue, making it easy for you to feel the pulse of the communities movement. As times have changed, so has our ability to provide access to the magazine. We are excited to share that digital back issues are now available for download in the Community Bookstore. Also each new subscription includes free access to the digital issue as well, or subscribers can opt for digital only subscriptions if preferred. To celebrate this evolution, we would like to offer you a special gift! From now until the end of 2014, for each subscription to the magazine you select, including renewals, subscription bundles, multi-year, and gift subscriptions, you will receive 1 FREE digital back issue of your choice! There are now 164 issues with popular themes such as renewable energy, permaculture, ecovillages, inter-generational living, and many more! Select your subscription to Communities magazine here. Then just forward your subscription receipt to [email protected] with your back issue of choice, and I will email it right over to you. As the Business Manager for Communities magazine, and a proud supporter of it’s educational purpose and inspirational mission, it is my goal to increase subscribers by at least 100 people by the end of the year. Can you please help us to reach this goal? Thank you so much for your passion and support. It keeps us going! May your day be vibrant and meaningful!